The UK needs to tackle "bullying tactics by market leaders" and the other consequences of a lack of competition in the technology sector, according to a new report. 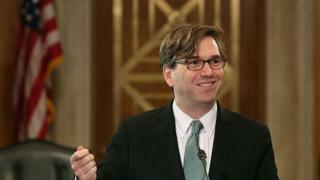 The review was led by Barack Obama's former economic advisor, Jason Furman. TechUK, the body representing the UK tech industry said UK tech firms had created thousands of jobs and "embraced the principles of fair and open competition". The report said there needed to be quicker and simpler enforcement when a company used "bullying tactics", abusing its dominant position in the market, by for example giving preferential treatment to companies it owns, or driving out competitors with predatory pricing. "There are a lot of benefits to the digital sector, but when you have these large companies that are so dominant in so many markets, consumers don't have the choices they should have," Prof Furman told the BBC. "And when they don't have the choices they should have, you don't get as much quality, you don't get as much innovation, and I think we can do a whole lot better." Listen: How can we regulate big tech? Prof Furman said the panel was outlining "a balanced proposal" which would deliver an economic boost to the UK by supporting tech start ups and innovation and benefit consumers. He told the BBC that currently consumers aren't easily able to switch away from a social network or a search engine if they don't like privacy policies or advertising policies, because there is very limited choice. "I think we haven't done enough about it," he told the BBC. "In part that's because in the early days of the internet there was a whole series of companies one after the other. "In search you had Yahoo and Lycos and Altavista and then Google, and you might be forgiven for thinking it's all very transitory and there really is a lot of competition and change. "But with each passing year it's becoming increasingly clear that absent a change in policies, we can't count on that continued cycle of competition." Regulators should have greater powers to tackle anti-competitive practices, including "bullying tactics by market leaders"
Julian David, chief executive of TechUK said: "Bad regulation can be as big a barrier to competition and innovation as monopolistic activities." He said it was vital that both the CMA and government bodies involved in digital policy had sufficient expertise for "getting technical decisions right". TechUK said more detail was needed around the proposed measures, in particular "the risks and benefits of requiring companies to open up data sets". "Such issues raise important questions around the protection of personal data which may not easily be overcome. "There may also be technical barriers to such a proposal due to the interoperability of data sets," said Mr David.